No stop reading and go buy a ticket for the screening on Sunday so you can see this film on a BIG screen. This is one of those awesome films that is so much better when seen really really big. 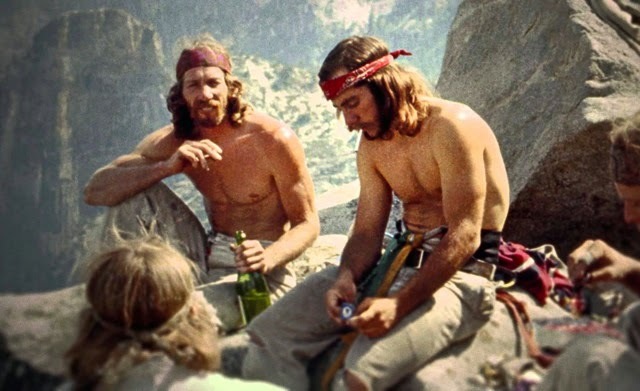 Valley Uprising is the story of the rock climbing community in Yosemite National Park from 1955 to the present. Over the course of the film we watch as the climbing community began to form after the second World War and how in things really took off with climbers such as Royal Robbins and William Harding who’s rivalry pushed the sport forward as they fought to try and do the impossible, from climbing Half Dome or El Capitan. We then watch as the old guard gave way to the Stone Masters of the 1970’s and 80’s and how their antics gave way to the modern day Stone Monkeys who have given up ropes and now free climb and base jump. Not to put too fine a point on it this is a wickedly cool movie told by the people who lived it. To put it another way I absolutely loved this film and if I can manage it I’m going to go back and see it when it plays as part of the Mountainfilm series. I think this film is super. A perfect blend of talking head, photographs, period film and modern day shots come together to form a glorious sense of being there- which in this case puts us in the park and on the vertical walls these brave but crazy individuals climb. This is the only way to approximate what its like to climb the rocks and then jump off them. What also sold me on the film is that the talking heads that appear are well spoken and manage to explain what it was like to climb and to put it into the context of their time. Often in films like this we get interviews with action sport stars who can’t go beyond the cliché or can’t put it all into any sort of context keeping things at the ‘Hey this is what I do, what more do you want” level. I always want to go “yea, I know that. And its cool to look at but tell me more- really tell me whats going on” More times then not they are incapable. I had a blast with this. I had to make a certain train home and when the film started late I feared that I would miss the end- so when it got close to time I got up from my seat and stood in the back of the theater getting ready to book to the subway when the film ended…I simply couldn’t leave I had to stay to the bitter end. Seriously this film is a blast. While it may not be the best of the year- seeing it in a theater on a huge screen made for one of my favorite viewing experiences of the year- get a ticket and go.